A cracking looking day on offer for Sunday. 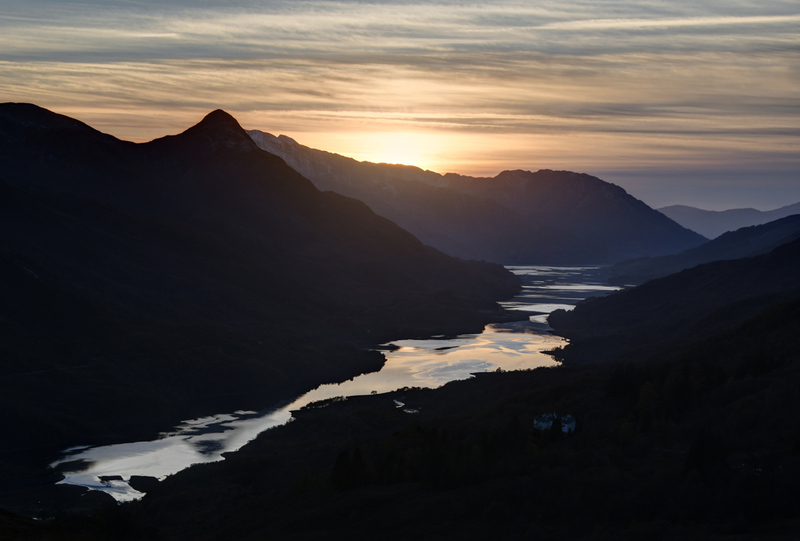 As is our wont we were still humming and hawing about what to do as we set off from Fort William in the dark – decided to head round to Kinlochleven. 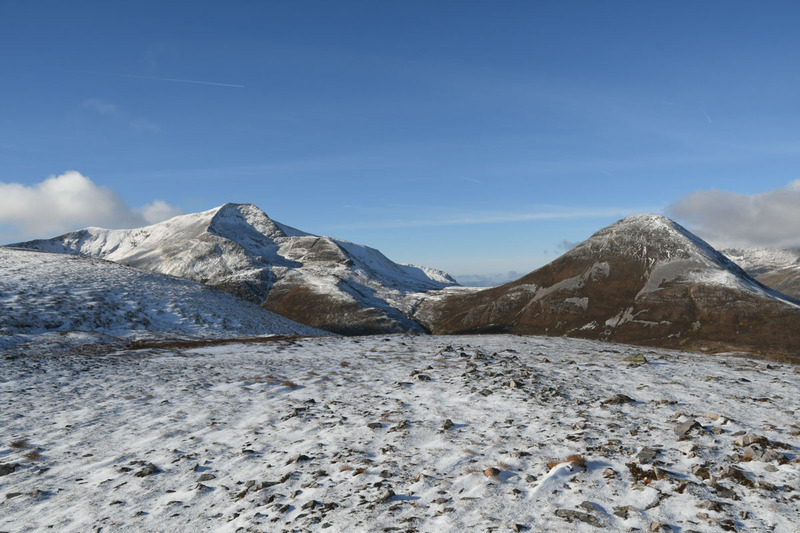 When we started hillwalking we were out in the Mamores a lot, since then, as we took to favouring the NW and islands on the best days, we have been very infrequent visitors. A shame, given how amazing this little group of hills is. 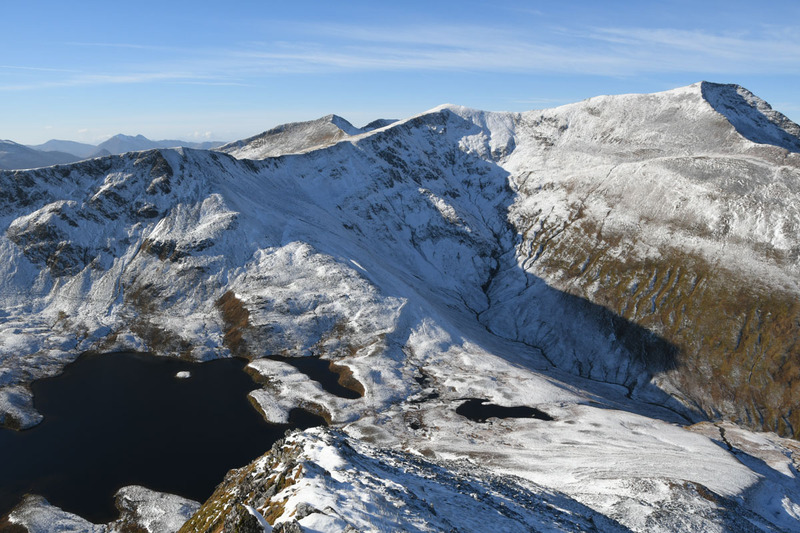 We’d only visited the 2 eastern Mamores, Sgurr Eilde Beag and Binnein Beag on one occasion – a misty day round the 4 eastern munros. 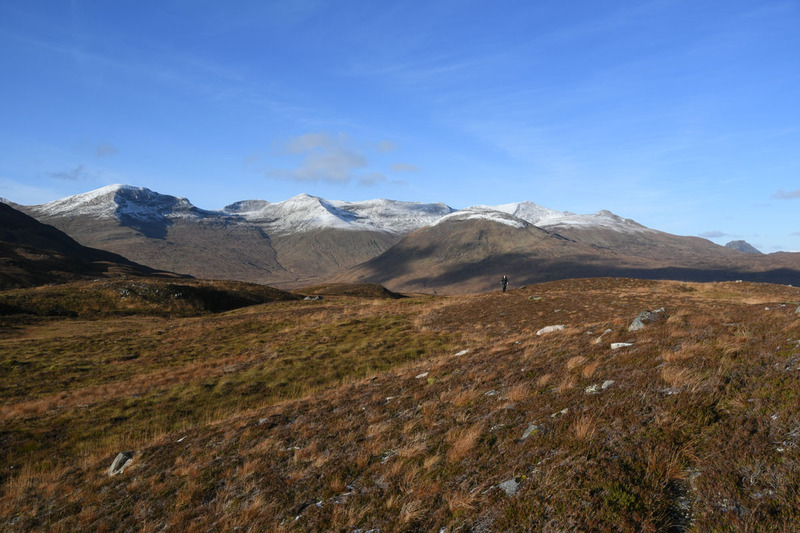 A viewless, steep, boulder ascent and descent of the munro had not endeared the hill to the team. As usual, route doodling had come up with an interesting little exploration that might rehabilitate the hill. We didn’t change our clocks to make this seem a longer lie…..we set off from the parking area at NN 177 622 about an hour before dawn. With a big moon it was light enough not to need headtorches. 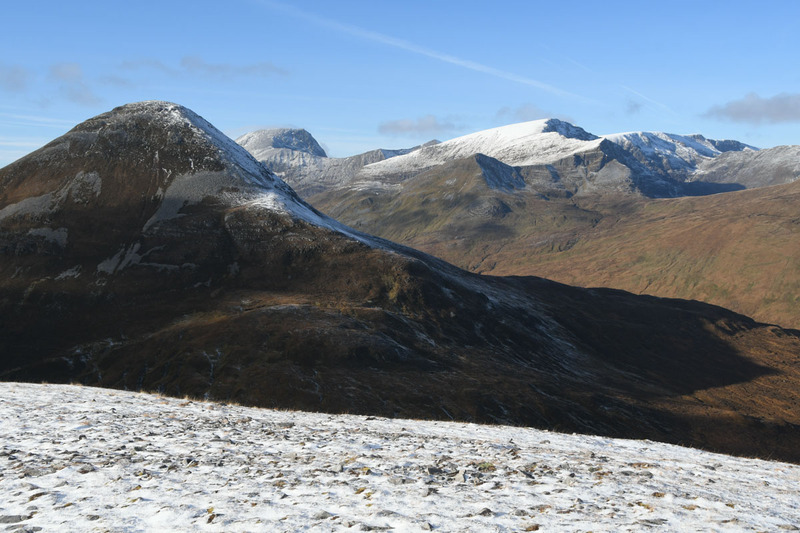 Headed up past the now-defunct Mamore Lodge Hotel and out the access road to the eastern Mamores. 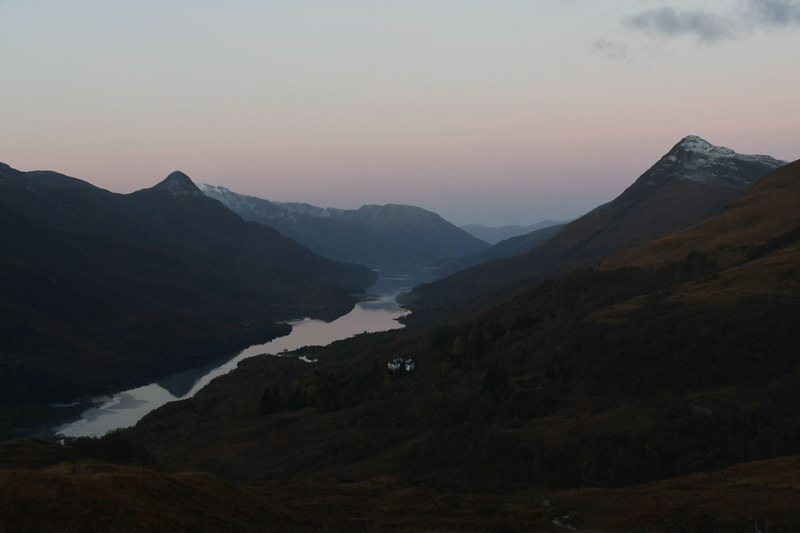 There are paths up from Kinlochleven, but for low light access a full track is certainly easier. Made rapid progress up the road, the antisolar shadow was just sinking to the horizon as we reached the viewpoint down Loch Leven. 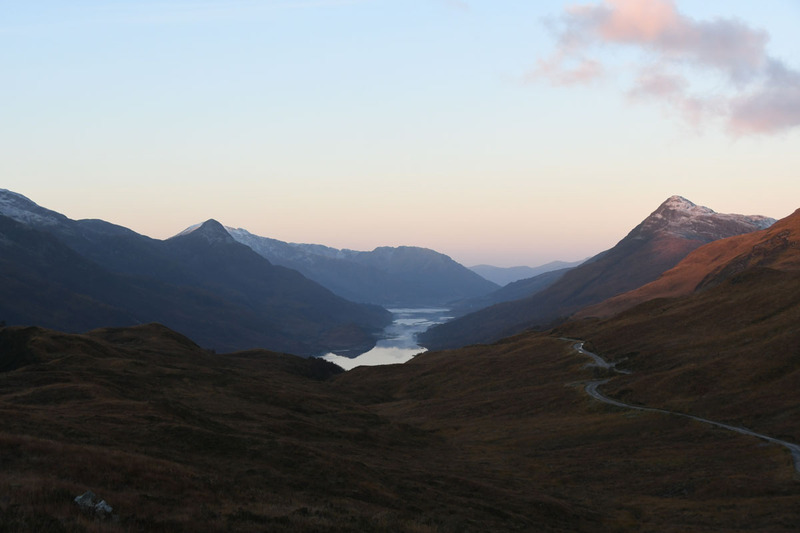 We carried on and the first light of the sun was catching the hilltops as we approached the height of the lochs. 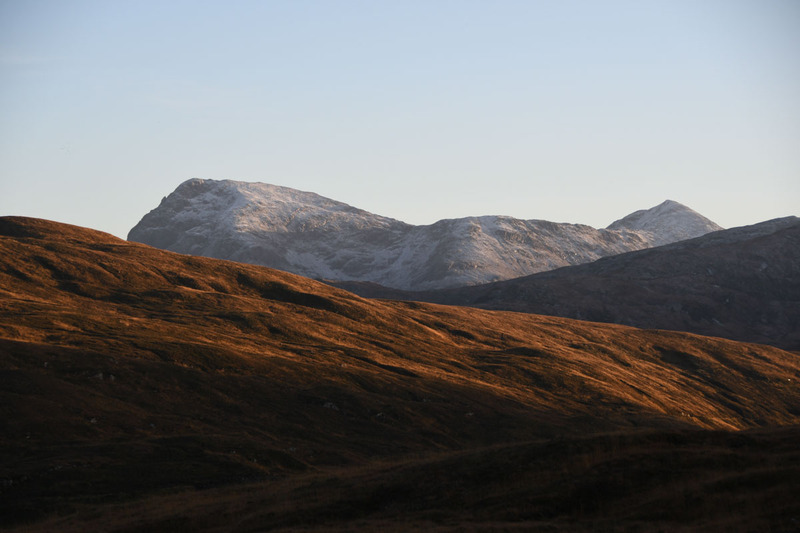 Beinn na Callich (the lower top of Mam na Gualinn) was nicely lit. At the far end of Loch Leven Beinn a Bheithir was catching a bit more sun. 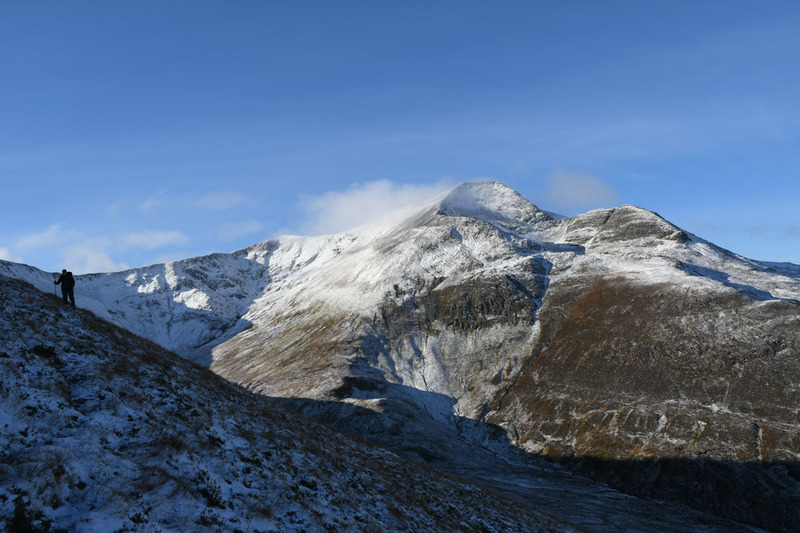 As the track approaches Loch Eilde Mor the profile of Stob Dearg catches the eye above the high ground to the south. 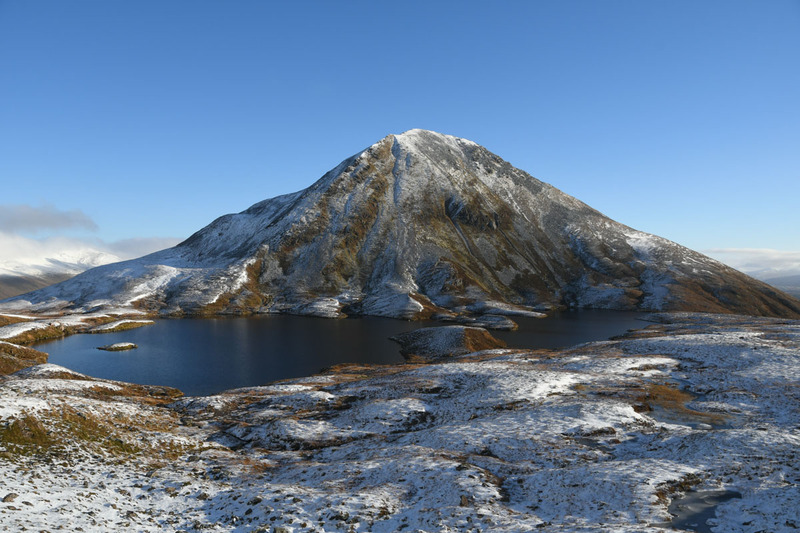 We had initially planned to head out along Loch Eilde Mor and ascend the stalkers path over Seana Gabhail to approach Sgurr Eilde Mor along its NE ridge. Having almost reached Loch Eilde Mor we realised this would be still in shadow for a little bit yet, so we cut uphill to join the path up to Coire an Lochan between Sgurr Eilde Beag and Sgurr Eilde Mor. This put us in the sunshine within 10 minutes of climb. This is where you want to be on a great day – in the sunshine enjoying the view. 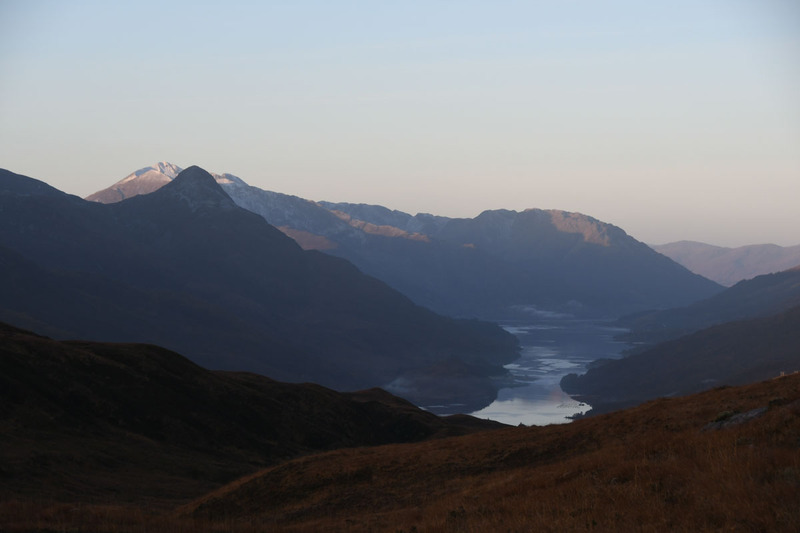 As height is gained there’s more expansive views of the Glen Coe hills. Above us the tops of the Mamores were fairly white. I’d carried the ultra light ice axes, but I was pretty sure they’d simply be training weights. 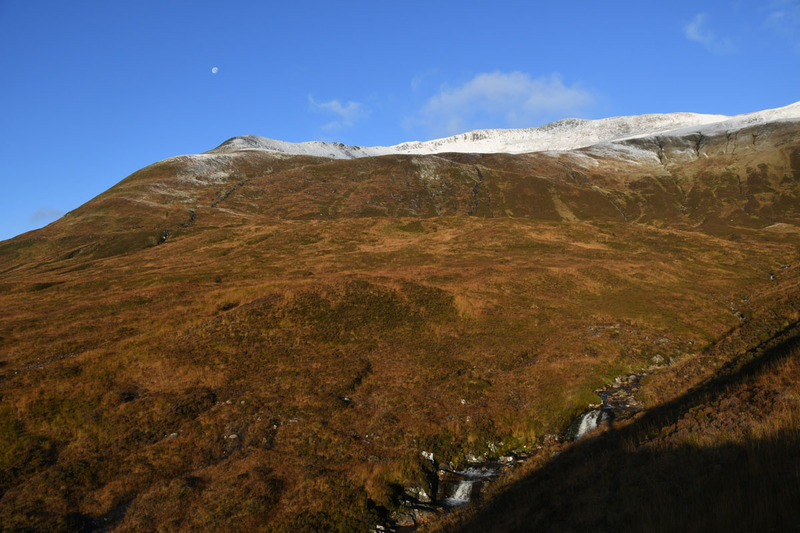 The moon was still up over the south ridge of Na Gruagaichean. 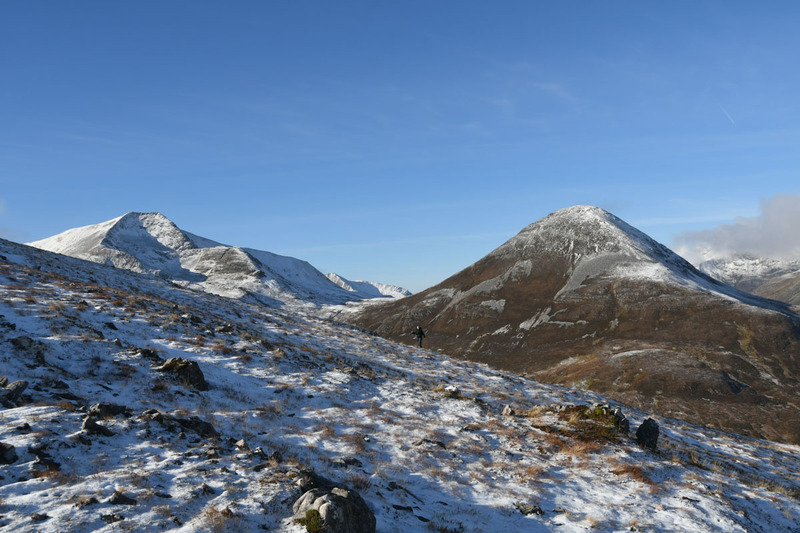 The path gains height steadily to curve round Sgurr Eilde Beag and into Coire an Lochain, it felt distinctly warm in the sunshine. Loch Eilde Mor was still not in the sunshine so we felt we’d made a good choice reversing the route plan. The hills to the south were looking grand in their new white coats. 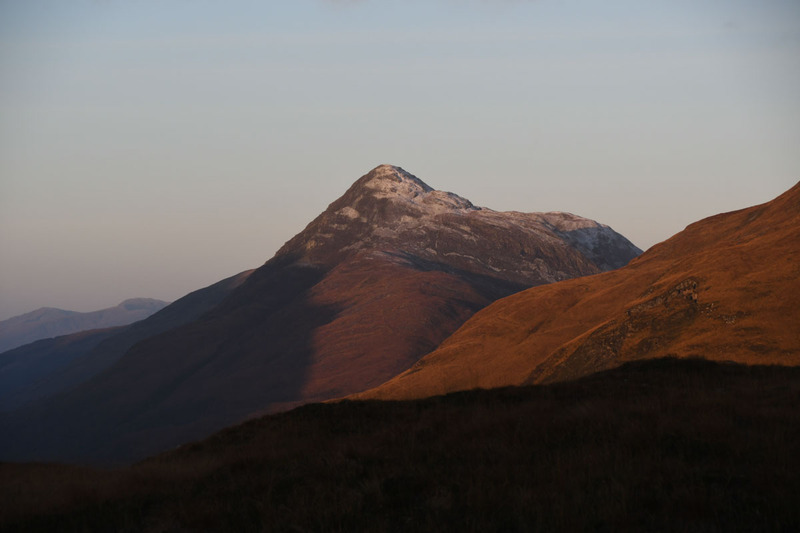 Both the Pap of Glencoe and Beinn a Bheithir were looking very tasty – more hills in need of revisits. 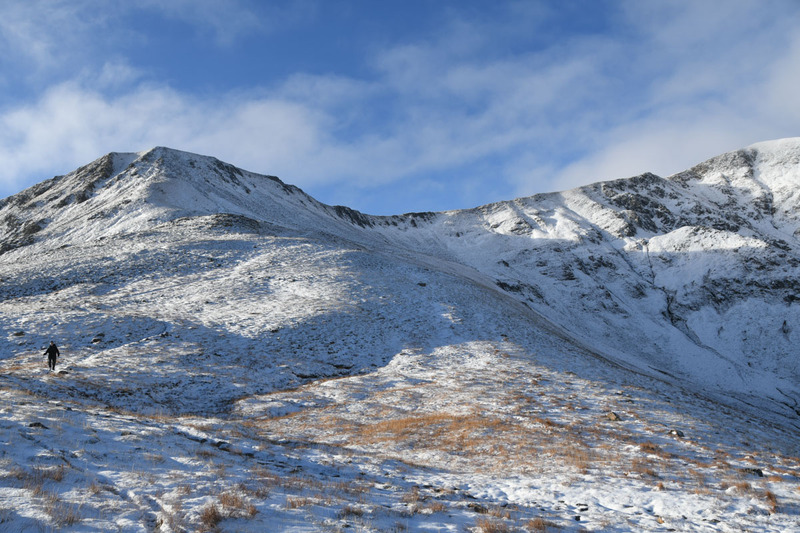 Rounded the corner into Coire an Lochain – what a great looking place with a bit of snow on it! 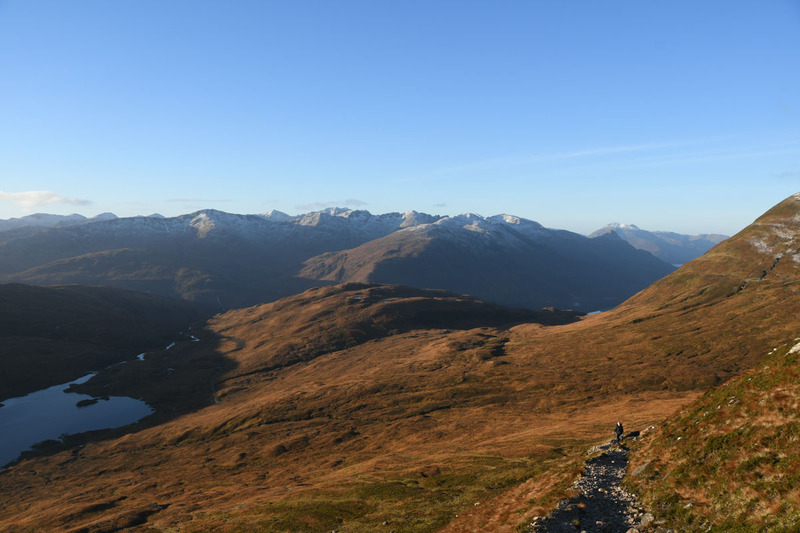 The standard munro route heads up the south side of Sgurr Eilde Mor and then down the north side. 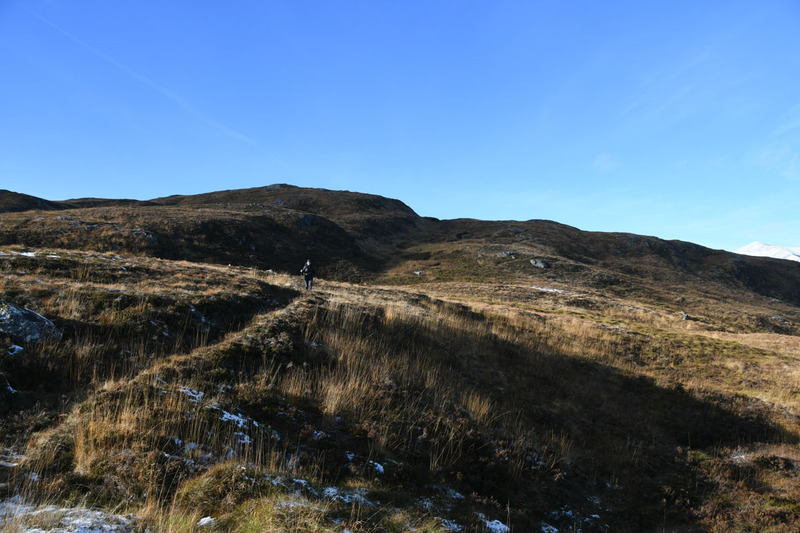 The south side would have been fine for an ascent, but we were aiming to traverse the estate path out along the north flank of Sgurr Eilde Mor and then ascent the hill along the NE ridge. 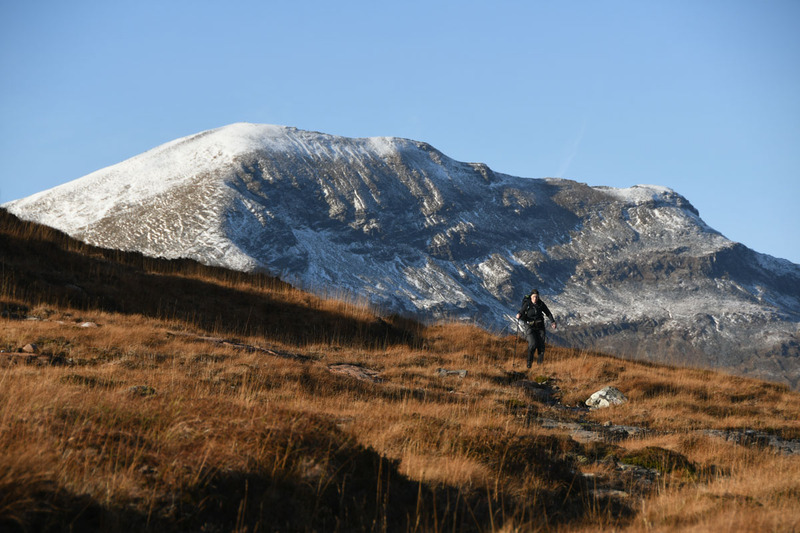 We headed through Coire an Lochain under Sgurr Eilde Beag to pick up the path. 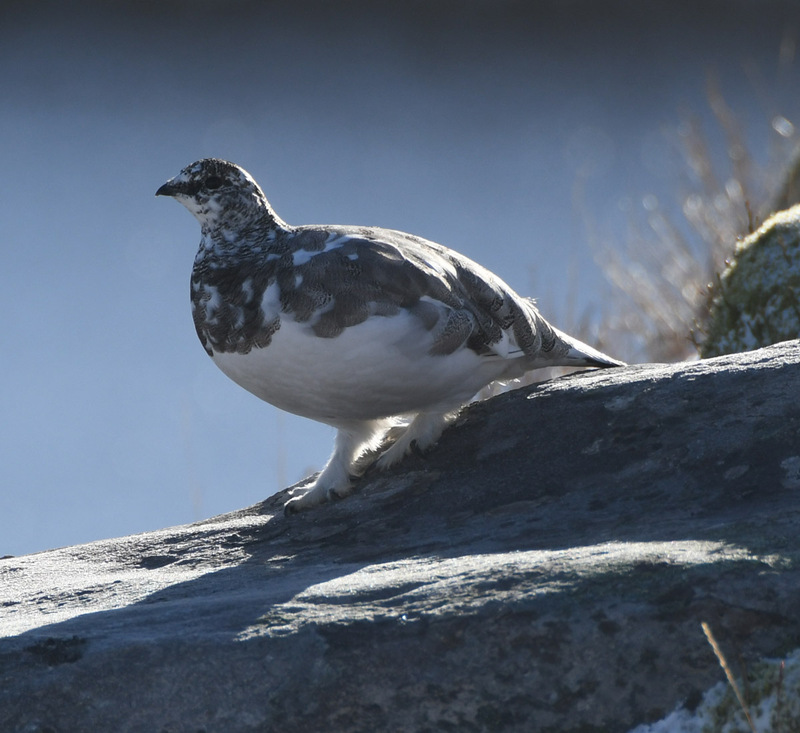 A whistle from H alerted me to the fact that I’d almost trod on a hiding ptarmigan which had broken cover behind me. 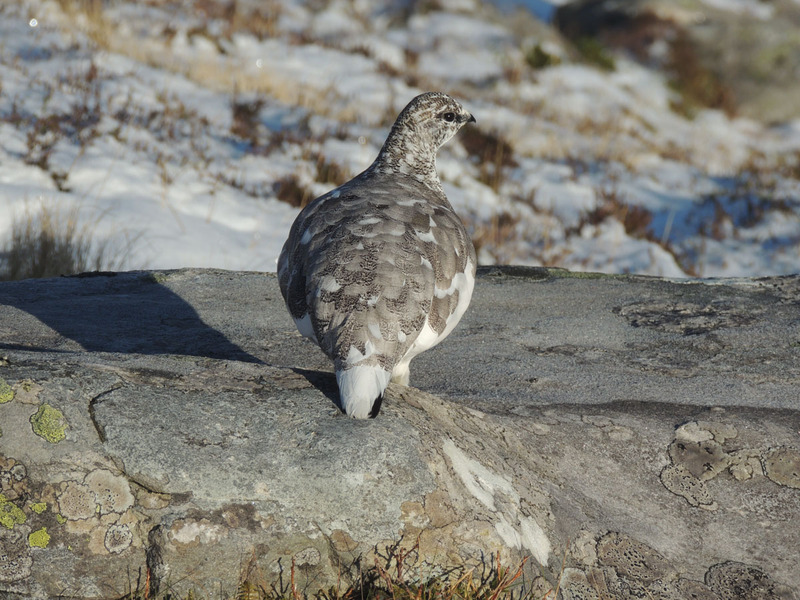 It seemed very loathe to move further – I wonder if it had seen a more threatening predator like an eagle. The stalkers path to Binnein Beag drops off the little plateau of Coire an Lochain to the north, we headed NE along another path flanking Sgurr Eilde Mor. The path was sketchy and hard to follow – I suspect it is little used and with snow cover was very easy to lose. Fast progress where we had the path and a little less where we lost it. The views were stunning though so we had adequate distraction. 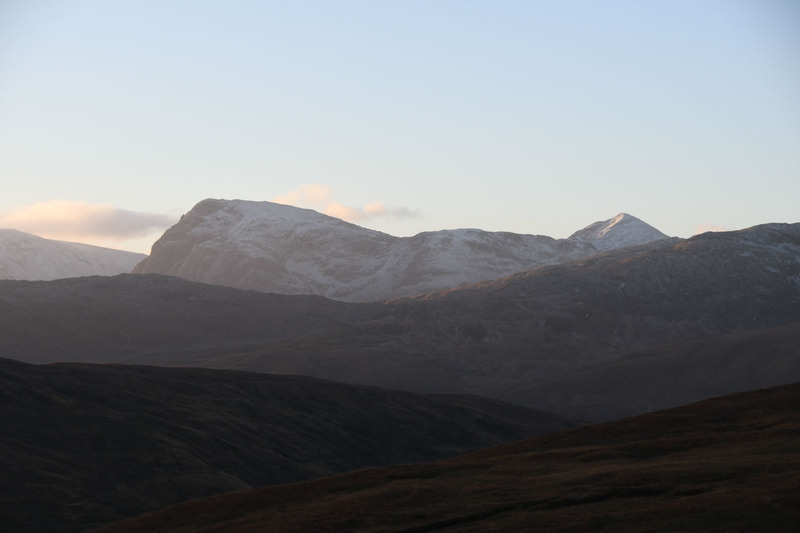 Having woven between the hills we now had great views of Binnein Mor, Binnein Beag and Ben Nevis. 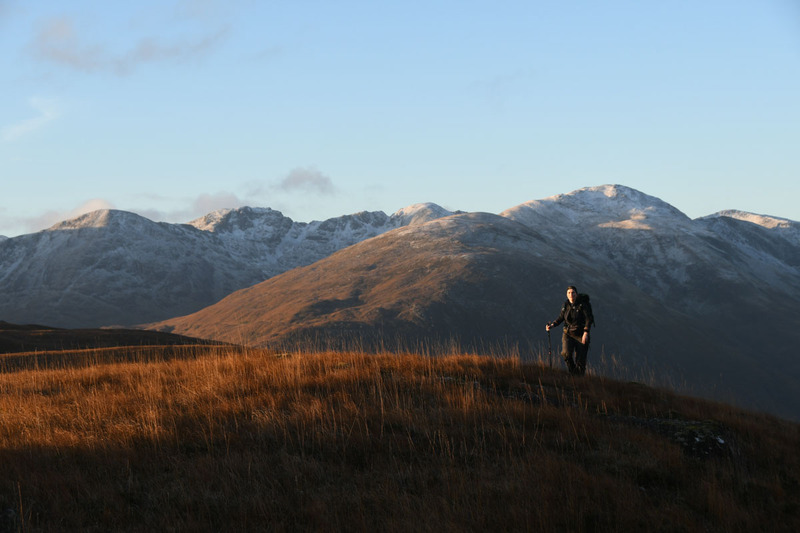 The traverse also had us up above Coire a Binnein, which was hosting a very large number of deer. In the still air the calls of the stags were loud and frequent. Listening to the stags while walking on snow is a transition season experience. We picked up the pace for our 2km traverse – in the shade was not where we wanted to be. Didn’t take too long to get to the end of the NE ridge of Sgurr Eilde Mor (indeed, we could have cut uphill earlier if we’d wished). Emerging into sunlight is always welcome. 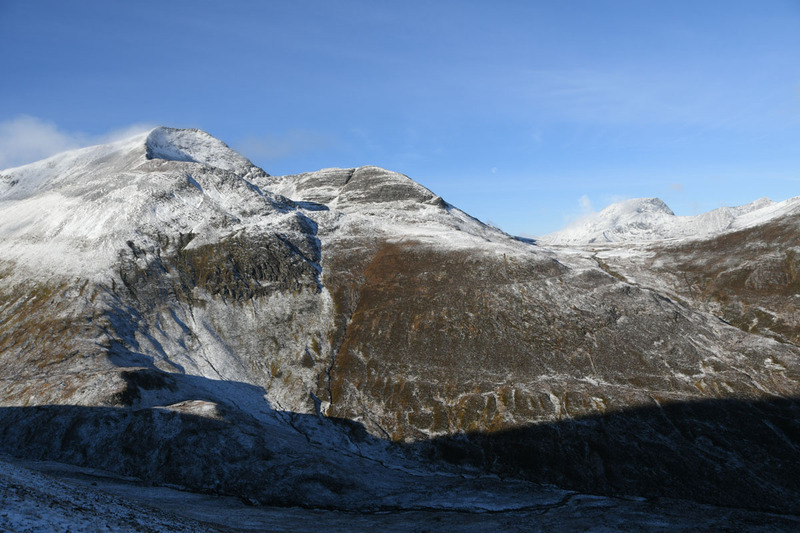 Sgurr Eilde Mor is a crag and tail hill – most of these are approached by the tail for walking routes, necessity and bagging mean Sgurr Eilde Mor is usually visited via the craggy end. 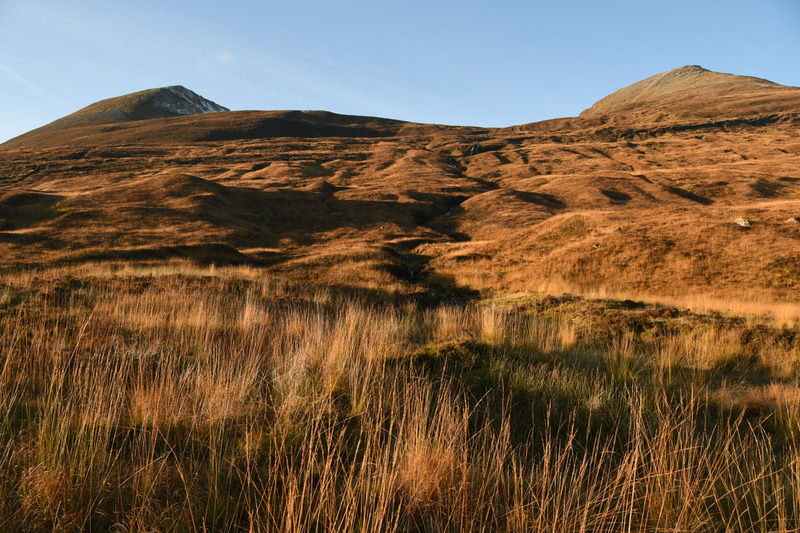 A pleasant, easy-angled quiet munro approach is nirvana. Ambled uphill enjoying the views again. The snow dusting had definitely added to the aesthetic. 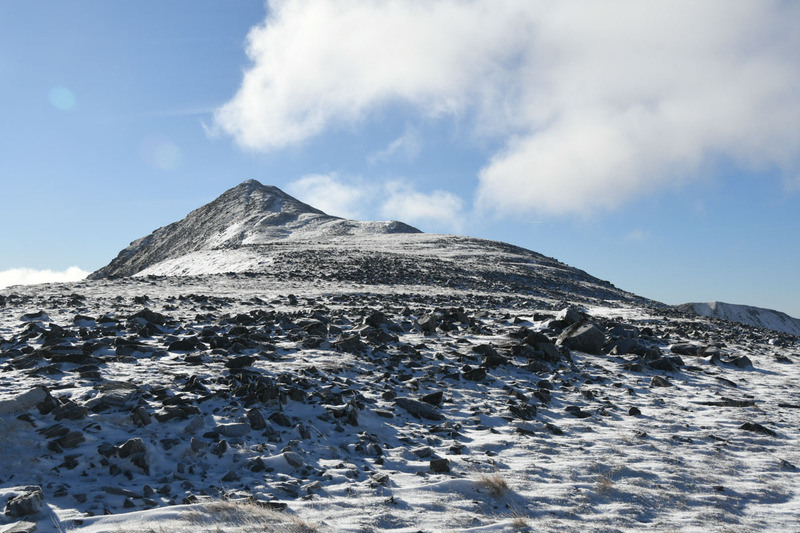 Sgurr Eilde Mor has a pointy look to the final summit pull – but this is only the last 40m. I had wondered if the ridge might be more boulder at height – but it’s pretty smooth and very easy terrain. 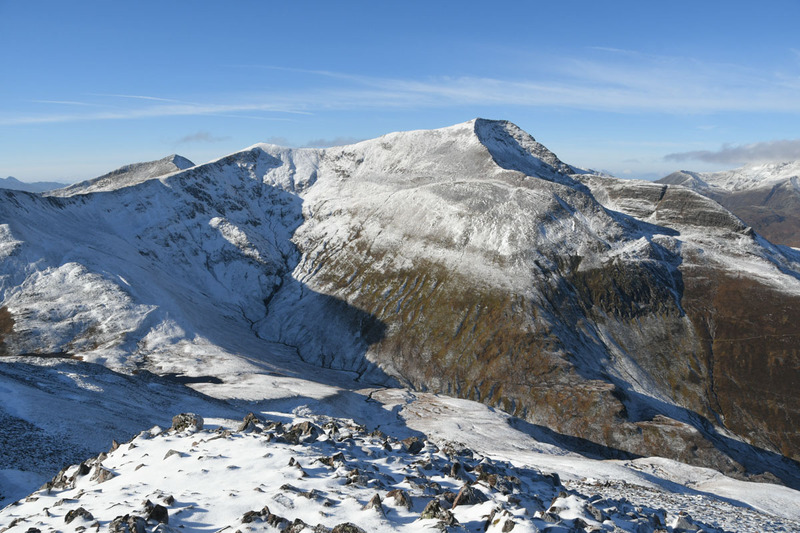 The summit gives great views across to Binnein Mor – probably the best of the Mamores for me. The summit had a few people around, some with plans for more hills, some not. 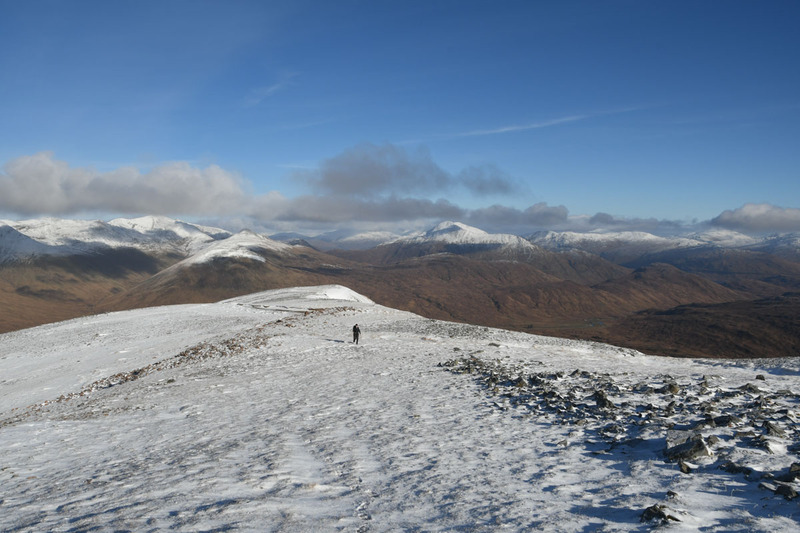 Headed down to the little spur 30m down to the west of the summit to get a view down to the lochain. Sat down and had our lunch, enjoying the view. 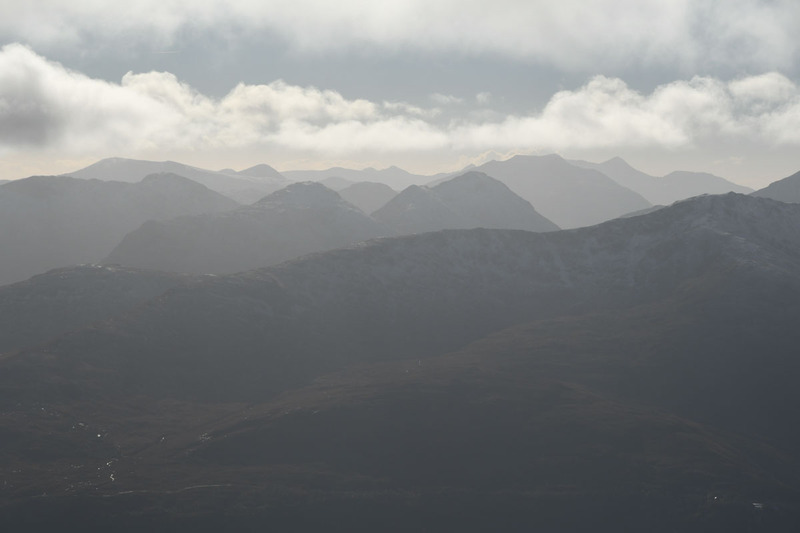 The views south were a bit sun-obscured, but we could see down to Lawers, Vorlich and Stuc a Chroin. Had a look at the route back too. 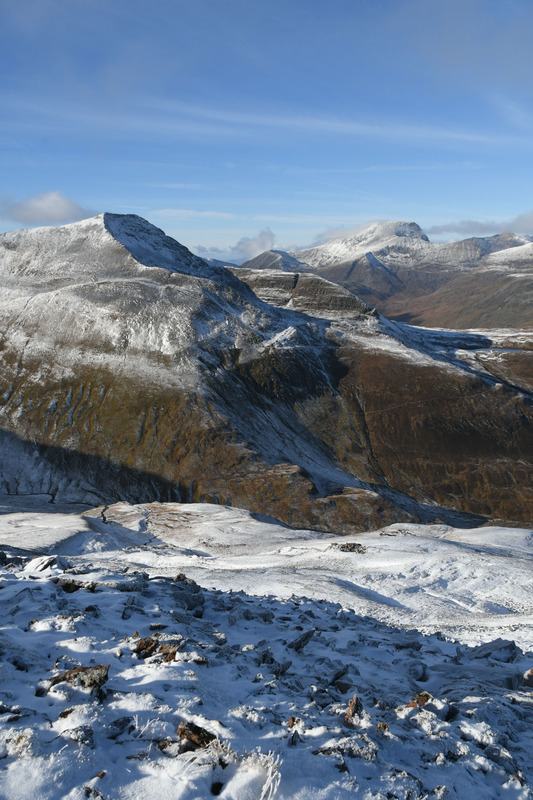 Best of the views were to Binnein Mor and the Ben – cracking. We could have descended the south side of Sgurr Eilde Mor, but our plan was to squeeze as much out of the day as possible. We reversed route down the NE ridge to where we’d joined it. 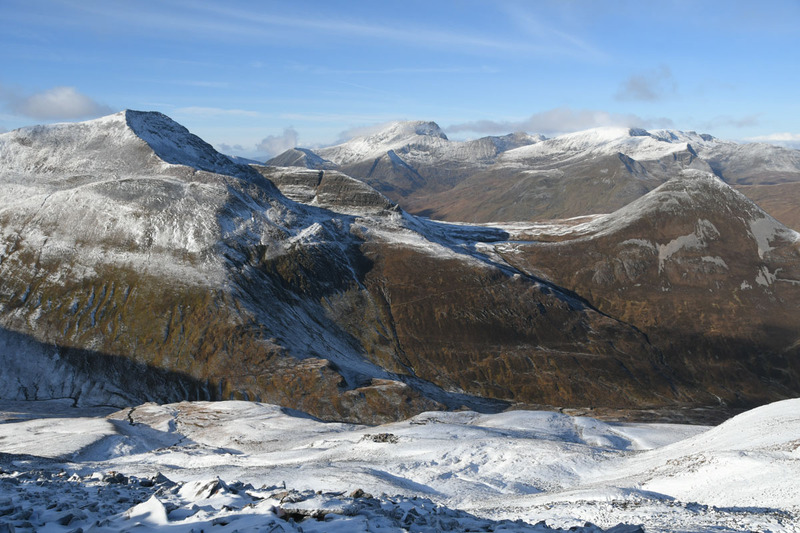 As the ridge is descended the cliffs of Aonach Mor come into view – these are hidden from most of the Mamores. The Aonachs and Grey Corries had been part obscured by little streamers of cloud much of the day, these were clearing away now. 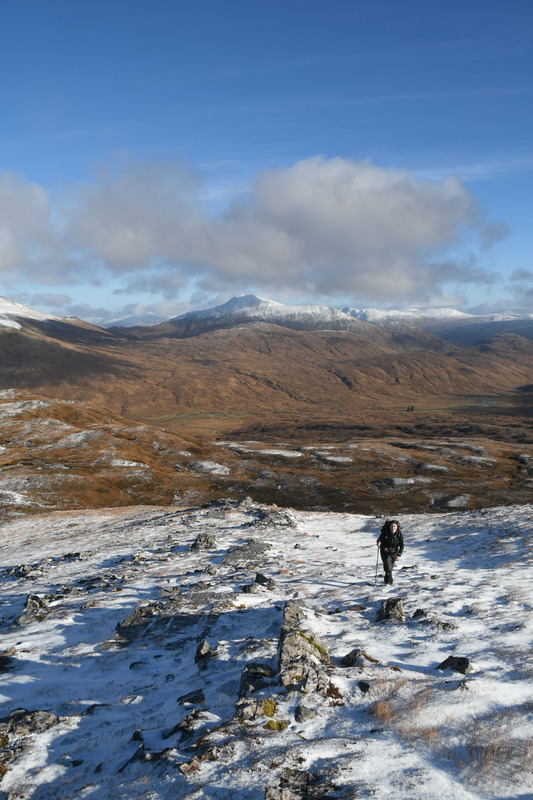 Dropped to the end of the ridge and then picked up the estate path again, this time heading SE towards Seana Ghabhail across some gnarly high ground. The path was in good nick for the most part, and although it meanders a little it made easier work of crossing the gnarly terrain than a direct bushwhack. 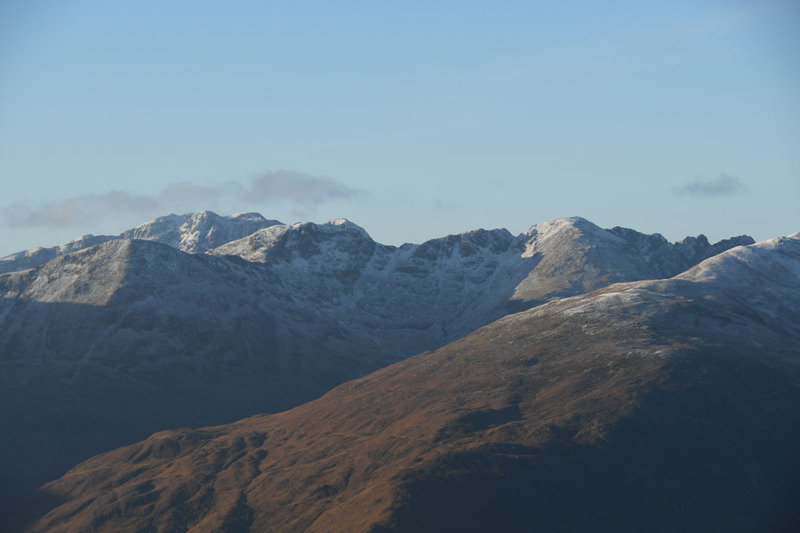 The NE ridge had given very fine views of Aonach Mor and the Grey Corries. 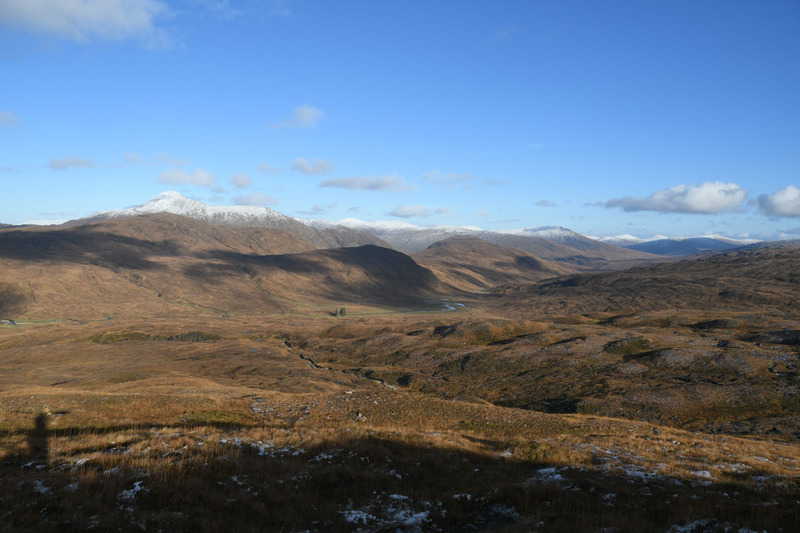 It also has a fine view over the hinterland between Corrour and Glen Nevis. 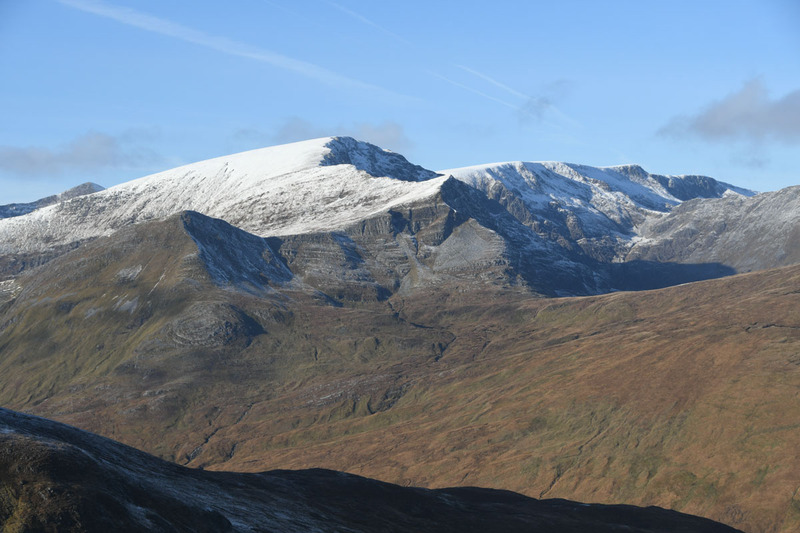 We recognised Creag Ghuanach that we’d ascended 6 years ago en route from Corrour to Fersit. 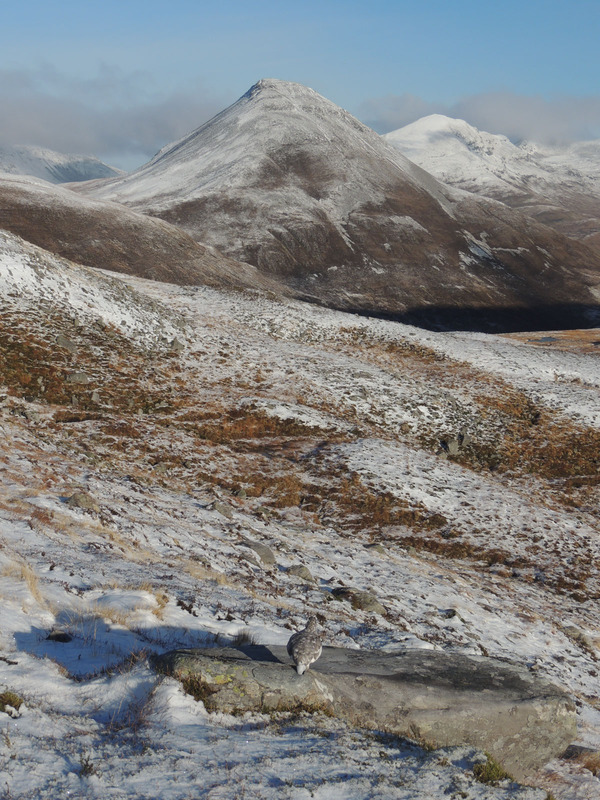 The top of Abhainn Rath and Meanach bothy are places we’ve yet to set foot on. Nice to see some new targets to visit. Picked up the pace – it was under 3 hours to sunset and we were still at the furthest distance from the car! Dropped down to Loch Eilde Mor and from there it was a track yomp home. 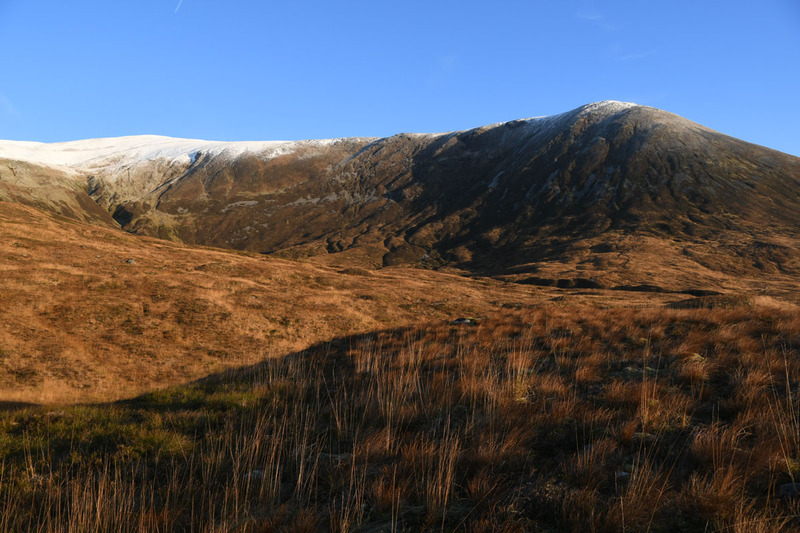 The lowering sun lit the grasses beautifully – the snowfalls will flatten all this vegetation, but autumn shows it off at its best. 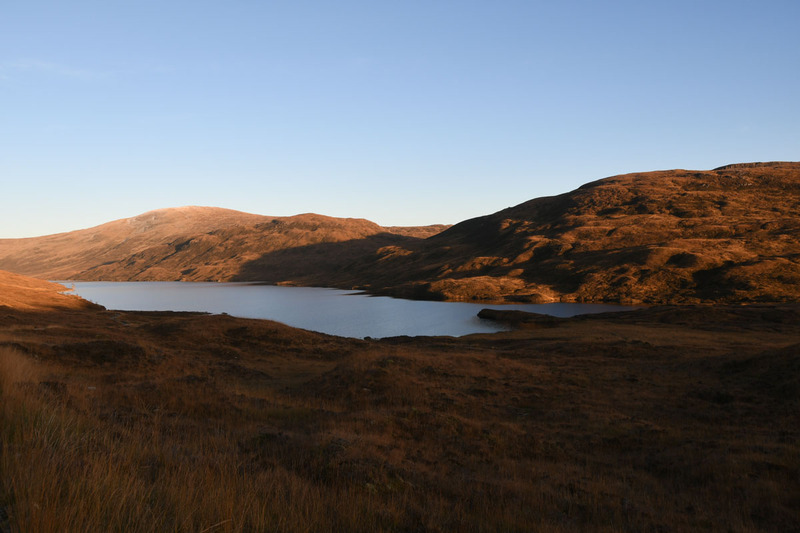 The Big Bookil was about to disappear under the local horizon as we reached the end of Loch Eilde Mor. 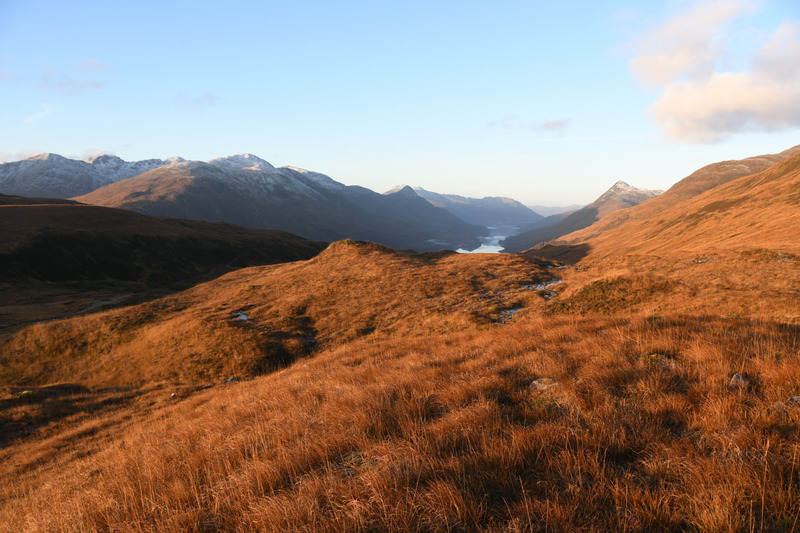 The sun was just setting into the slopes of Beinn a Bheithir when we got back to the bench above Kinlochmore and Mamore Lodge. Stopped and took some photos and put on jackets with temperatures plunging. From there we sauntered down the road and back to the car listening to redwings trilling in the trees as we passed by. Back at the car without the need for headtorches. 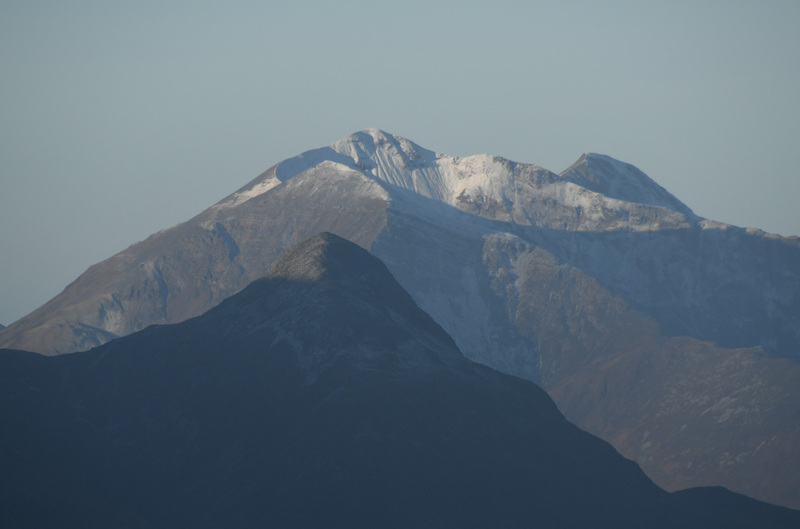 Nice Kinley , I hope to visit the Mamores before the end of the year .. If the weather picks up maybe this time home hopefully. I’d almost forgotten just how stunning the area is. Wish I could be in 10 places at once on days like that. 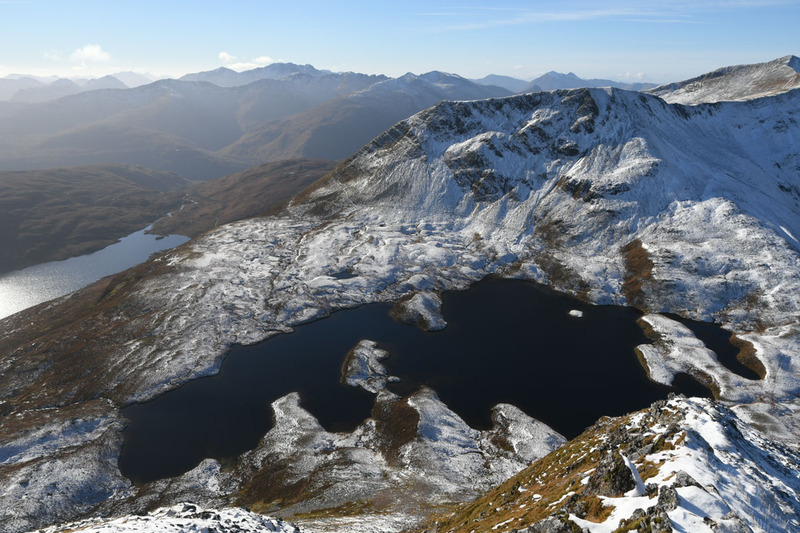 ← Stob Dubh from Alltchaorunn – 3rd time lucky. 27th October 2018.